Working on your anger management skills is a positive step towards eliminating the risk of violent behaviour. This ensures the safety of yourself, your family and others and generally helps you to resolve conflict constructively, without alienating others. It is very understandable that you want to blame others for what has happened to you, particularly if the situation could have been prevented or improved by other people’s actions. You will probably find, too, that your feelings of blame consist of a confusing mixture of guilt, fear, loss of faith in a just society and your own sense of personal vulnerability. When you have been traumatized, the source of your anger may also be linked with feeling a lack of control over situations, which you may not have experienced before. The physical symptoms – a pounding heart, sweating palms, rapid breathing, rising blood pressure- that are present during a situation of tremendous stress or fear are experienced when anger is “on the boil”. Nevertheless, in some instances anger can be useful! For example, when it leads to a struggle against injustice, when it helps a parent to defend a child or when it leads to community action on a problem. The key is to channel your anger effectively. On the other hand, when anger is bottled up until it explodes, the results can be dangerous and violent. Acting out your rage will not erase what has happened, and it could result in serious consequences for you. The people who seem to fare best are those who learn how to understand their own temper, and express their anger appropriately. By achieving a healthy distance, they are able to move on with their lives, instead of remaining victims of their experience. Rather than feeling “stuck” in an anger cycle, where every little thing that happens triggers the same overly angry response and you seem to be either suppressing it or lashing out at others, taking responsibility for managing your own anger is a positive step towards gaining control over your life again. When you are able to manage your anger effectively, you will have more choices about how you respond in any given situation. We all know what anger is, and we’ve all felt it: whether as a fleeting annoyance or as full-fledged rage. Anger is a completely normal, usually healthy, human emotion. But when it gets out of control and turns destructive, it can lead to problems—problems at work, in your personal relationships, and in the overall quality of your life. And it can make you feel as though you’re at the mercy of an unpredictable and powerful emotion. We will discuss some methods to control anger. This approach draws on your newly developed skills of paying attention to your body signals, in particular , signs of temper rising. It has been taught (in various forms) and used successfully for many years by groups such as Narcotics Anonymous, whose participants have often turned to drug or alcohol abuse as an ineffective way of managing explosive tempers. 1. Picture, in your mind’s eye, a very large thermometer. Try and allow yourself to see very clearly the gradation marks on each side of the glass tube that register the degrees of temperature rising. The mercury inside the glass tube is red. We will use this to represent your temper. 2. When you are calm and cool, there is very little mercury in the tube, just enough to help you pay attention and interact effectively with others. However, when you start to become agitated, the temperature starts to rise and the mercury level in the tube will go up! 3. Because you are much more in tune with your bodily signals now, you will notice how your breathing begins to quicken when you become just a bit agitated. Your muscles tense, and you become aware that your eyes are squinting a bit, your nostrils are flaring. In short, as your “temperature rises”, you are starting to resemble a charging bull! The mercury in your imaginary thermometer is rising very quickly indeed. 4. Now, all thermometers have some red marks at the top to indicate “danger” and “overheating”. As you pay attention to the signals of your rising anger, you can start to picture the thermometer, and you can become aware of how close you are getting to the danger zone. It is time to bring the mercury down before you get into the “red zone”, where you will not to able to think clearly enough to take appropriate action. 5. If you allow your anger to boil over, you will be operating on raw emotion, with very little (if any) rational thought. Those are the situations where you are likely to get into trouble and do or say things that you will probably regret later, when they are hard to undo.Use all your skills to stay out of the red zone of raw emotions. 6. Keep being aware of your temper. • Pay attention to your breathing when you feel yourself becoming angry. Can you slow it down by taking five deep breaths? • Start by exhaling as fully as you can. Now with each breath, inhale, hold for a second , then exhale slowly, blowing through your mouth and counting backwards from 5 to 1. • Remember to exhale fully, as if it was a heavy sigh, then aging inhale, hold, exhale slowly, counting 5, 4, 3, 2, 1. Next breath, inhale, exhale slowly, counting 5, 4, 3, 2, 1. • Continue three more times and on the last breath say softly to yourself: “Calm and in Control”. Practise this technique frequently! • When you have reached “room temperature” level again, then you can begin to deal with the person or problem on a rational basis. Practise this technique as often as possible. 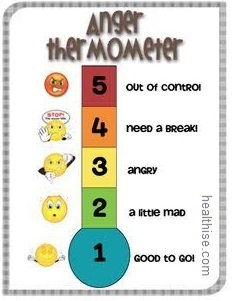 As soon as you find yourself getting worked up, think“THERMOMETER!”. This technique can be very effective, once you have learned it and as long as you use it regularly! Not always anger occurs due to short temper or may be. Often there is way more to a “temper”. It can actually be anxiety and depression. I know that is in my case. Though I do know very well how important it is to NOT have one, I have been battling health problems. Ironically, I just read today that one of the problems I have has a side affect of temper! lol! Now I have a reason, haha. Actually this “system” and especially that of the “medical” world is very flawed. That is unfortunate! Going from doctor to doctor and getting very little feed back, let alone accurate info can cause a temper and even more. I find that prayer and being able to talk it out is my best remedies. Also, at times I have to walk away. I even have to tell my husband that I “cannot go there”. Slowly he is learning that lately I am just not in a good way. We all need to be more understanding of all sorts of emotions, including that of having a temper. The only way to gain control of deep seated temper problems is to adapt an alternative way of thinking in situations that previously made you loose your temper. First, I want you to consider the rationality of loosing your temper. At best loosing your temper will make you look foolish and immature. Logically, you know nothing good will ever come from irrational anger. Next, you need to alter ingrained patters of allowing certain stimuli to cause you anger. Research shows we have brief moment of decision between a stimulus and our reaction, and with practice we can STOP in that moment and choose a more rational reaction. You must start small when using this technique. For example, you spill a glass of milk on the carpet. This may typically trigger a irrational anger response, but instead you take that brief deciding moment and tell yourself not to respond with anger. The milk has been spilled and you already have to clean it up. How will anger make the situation better? It sounds simple, but if you have never consciously acknowledged that fraction of a second between stimuli and reaction it can be very difficult spot it. Over time you automatically begin to STOP at that moment which then allows you the time to DECIDE your response. Like I said, it takes a lot of practice and you must start with small irritants and you will eventually be able to apply the technique to the most infuriating moments. It works, but can take a long time to gain such control over your emotions. Those who know you best and expect you to respond with the loss of your temper will be amazed! Its not very often someone takes the time and effort required to control their temper. It’s a wonderful feeling to gain control of your emotions.